If you wouldn’t have to work for the foreseeable future and money indeed grew on trees, what would you do with your time? Explore all the places piled up high on your bucket list, wouldn’t you! Answering at whim to the beck and call of what the world has in store for you, is every travel aficionado’s dream. However, there is way more to travel than flinging aside all your worries, getting on the next plane, and simply taking off! Not only do you have to contend with the hassle of booking a ticket, planning where to go, scout out what to eat and do at a destination, where to stay affordably, etc. There are times when travelers find themselves in a pinch, especially when they need to make a brief stopover on their way or are looking for a place to stay without timely reservation. Guests have to contend with negotiating relentlessly with hotels on the phone or even doing without hotel accommodations altogether. 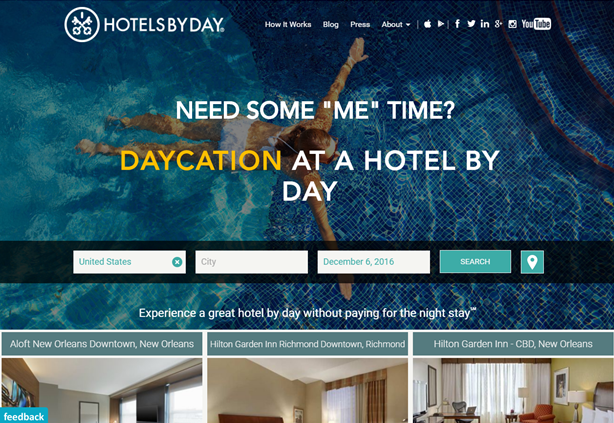 Since slow weeks and last-minute cancellations make it a trouble for hotels to keep their rooms filled as well, HotelsByDay leveraged an opportunity to help both the hotels and their patrons. This inventive platform allows travelers to book hotel rooms during the day. By monetizing available rooms during day time, hotels strike a lucrative deal while catering to new last-minute guests. Win-win! This platform has made it a breeze to indulge the call of wanderlust without protracted planning. Just as awe-inspiring as the very notion of this start-up is its website design and logo. Upon landing on the website, users are greeted with a banner presentation of what the platform has to offer, accompanied by top-notch photography forming a mesmerizing backdrop. The neat grid layout, a refreshing palette, and contemporary typography set this website a notch up in the design industry. The company’s website offers an unlimited access to patrons to capitalize on their extensive database of available rooms, and filter and customize their search to find a suitable place to stay. The logo of this start-up features a rounded keyhole, with an icon of crossed ornate keys beneath! A perfect logo to exude the buzz and urgency of last-minute hotel stay! TipGenie is an ingenious, cashless tipping platform, which allows a more transparent, efficient, and convenient system of mobile payments. TipGenie takes its inventiveness up a notch by allowing patrons to submit real-time feedback pertaining to their hotel experience. The app targets smart-phone riveted millennials, offering patrons the ease of scanning a QR code on an employee’s badge to tip them with a few easy taps! TipGenie tremendously helps the travel industry by offering a secure and infallible way of assimilating guest feedback and tips, highlighting areas that could use optimization along the way! In addition, adopting a mobile feedback and tipping app guarantees clearer lines of communication and a greater transparency between the hotel staff, management, and the patrons. 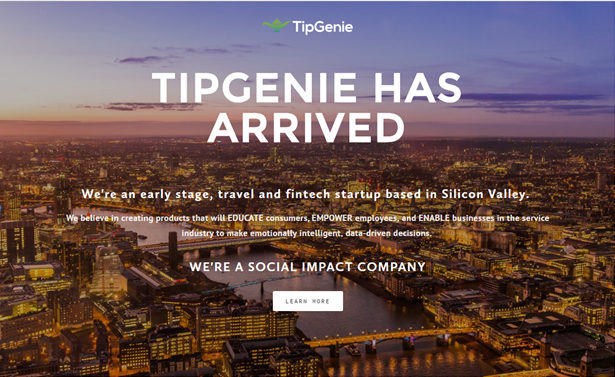 In order to herald the launch of innovation, TipGenie has designed a stunning website and a professional business logo to be the face of their business. 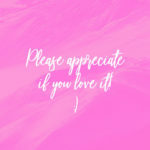 We specially love the vintage color overlay of the banner image, in line with the concept of transparency introduced by the business, rendering the clean, crisp white text highly legible. The clear call to actions, organized content, and plenty of white spaces, make this website design appear open and unimpeded, which is what the patrons want to feel. The minimal, san-serif logo of this budding startup is effective, and further reinforces the name and purpose of the business by incorporating a genie lamp icon in the logo design. 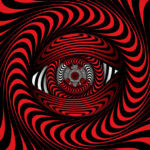 Overall, an impactful, ubber memorable, and indubitably scalable design! 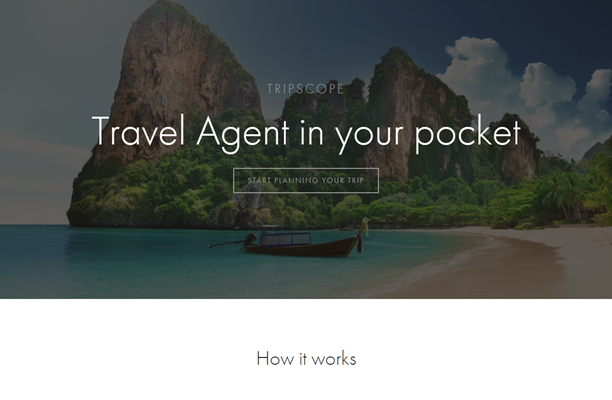 The innovative software solution TripScope brings the traditional offline travel agent to the fore and integrates it into the existing online channels. The start-up is aspiring to pioneer Intelligent Travel Assistants (ITAs), which connect real life travel experts with travelers through the TripScope platform. The platform has two amazing components; a mobile app for travelers and an itinerary management website for agents. The agent website lets travel professionals collaborate, manage, and create digital itineraries with travelers. Customer support, screen share, and video chat integrations craft an interactive traveling, planning, and personalized travel experience for avid travelers. To commemorate the “Future of professionally planned travel”, TripScope has come up with a viable website and logo design to represent their business. 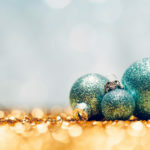 The banner image of the website, touched up with the color overlay maneuver, is an especially striking design detail, preserving the refreshing color palette of the underlying image, while turning it into a perfect canvas for the overlapping text. Intuitive navigation, effective design, and neat organization characterize this website design. In addition to the website design, the logo of this startup is highly memorable due to its striking color scheme, and the icon of a magnifying glass to reinstate the claim of the company, “Travel Agent in your pocket.” If you observe closely, the white spaces within the logomark double as a map. 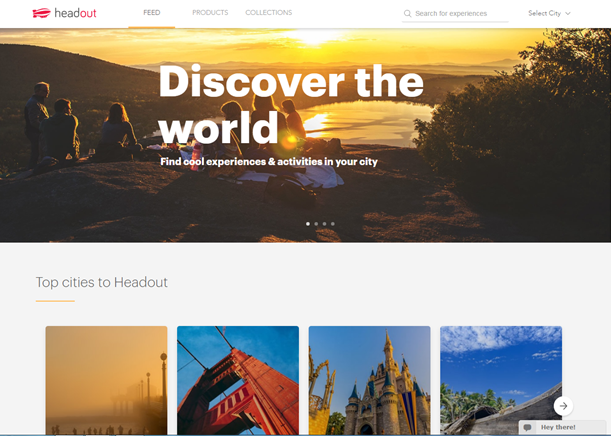 Headout is an on-demand mobile marketplace, a haven for travelers to book and discover the most incredulous local experiences, events, activities, and tours in town for the next 24 hours at exclusive promotional prices. 60 seconds of your time and 3 taps is all it takes to get started. They combine HotelTonight-esque discounted pricing with Uber-like convenience, offering an experience of a lifetime to a majority of 3 billion travelers who scourge out local experiences and to-do’s at the last minute. The key insight deriving the success of this app is the fact that most people book local experiences on a short notice. Headout is the only business in the niche that touts a 3x faster checkout rate, 15% cheaper pricing, and a 100% mobile operation. To imbue their users with a love for travel and all the thrills it has in store for them, the image slider at the top of the website incorporates awe-inspiring photographs of travelers having the time of their lives. 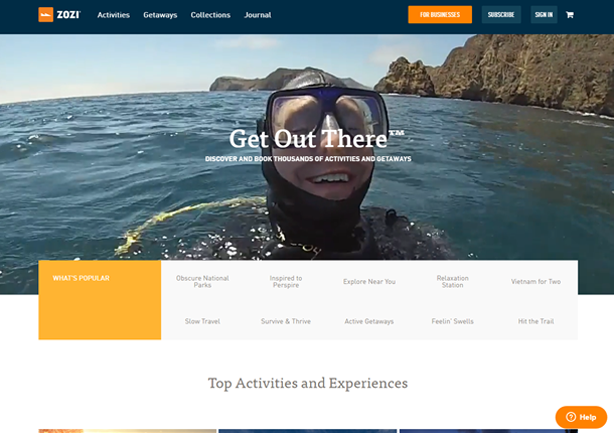 “Discover the world” with Headout and inside their stunning website design. The homepage incorporates myriad sections to let the visitors glean a sneak-peak into their snazzy sections. Flaunting a kaleidoscope of colors, a neat and organized layout, and semantically placed whitespaces, make this an upscale design. In addition, the fun and informal logo of the company, with an adorable icon of an air balloon, hints at how much fun travel could be with the right resources. 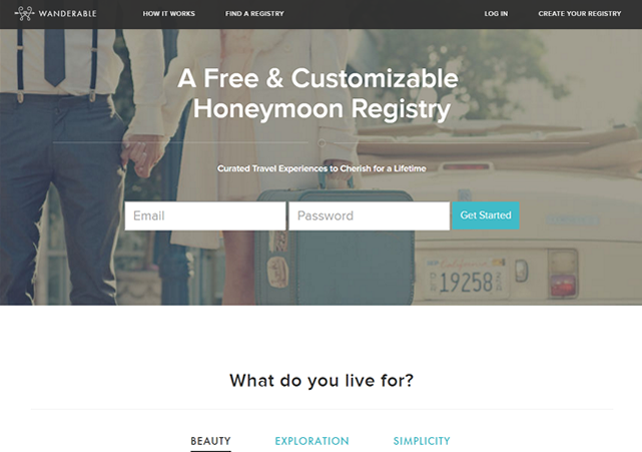 For engaged couples needing help to fund their honeymoons, Wanderable offers gorgeous free honeymoon registries. Instead of listing pans, pots, and pillowcases, couples post items and services pertaining to their upcoming honeymoon, from snorkeling expeditions to couple massages to hotel stays, into their Wanderable registry, so that their family and friends can pay for them in advance. No more traditional wedding gifts; just adventures and experiences to last a lifetime. Their mission is one of making gift giving memorable and highly personalized. Couples can use their mobile app, in addition to creating custom registries, to send thank-you cards to their patrons. Guests can also include a handmade gift box incorporating a note to the couple and the experience they are gifting. As elegant and breathtaking as the very notion of this startup are their mesmerizing website design and chic logo. The flowing loop of the “W” icon in the logo is rendered in the form of two connecting hearts, a perfect logo for a wedding registry website. The flourishing icon is perfectly balanced and anchored with the accompanying san serif wordmark. Organized layout, beautiful images, intuitive navigation, and ease of customized searching make this a truly memorable design. 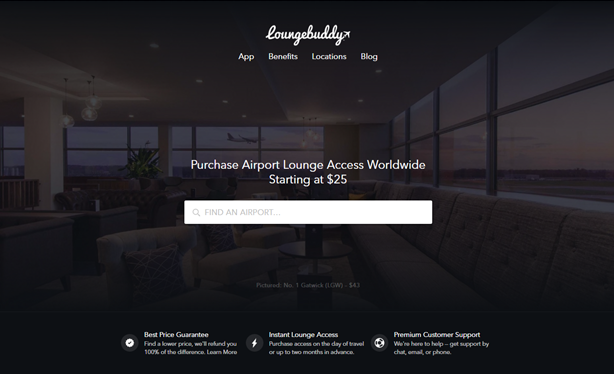 LoungeBuddy is the perfect app to unravel the mystery airport lounges are shrouded in. Whether you are a travel warrior who patronizes airports frequently, or a casual traveler seeking to access a lounge on your random trip, simply let them know a little about your trip and glean a comprehensive list of the lounges you can access for a one-time fee or even free of charge. With just a few taps on your smartphone, LoungeBuddy allows you to garner prompt lounge access to a vastly sprawling network of airport lounges. Peruse through their list of worldwide supported locations and book your lounge access in a matter of seconds! The creative logo of LoungeBuddy is not only clever, but incorporates a hidden message. In addition to the endearing script typeface of the logo, the “y” stroke transforms into an airplane at the tip. In addition, the website lists all the details one would feel curious to learn about LoungeBuddy, and the easy to search feature greatly reduces the learning curve! Waiting in long lines, frenzied online searches, or being smitten by terrible call-center hold music, are woes younger travelers will never know! 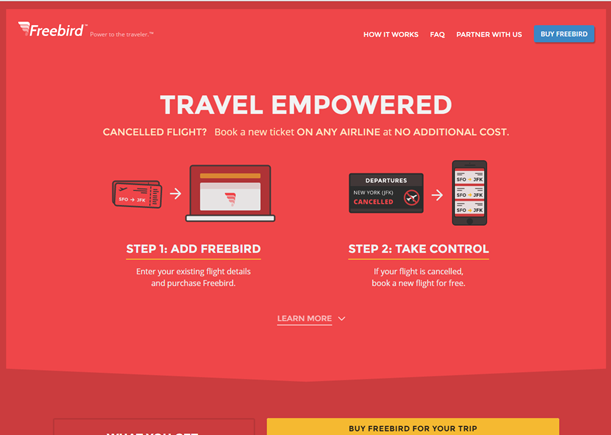 In the event of a missed connection, significant delay, or flight cancellation, Freebird empowers travelers to instantly book a new ticket and circumvent long and tedious queues, at no additional cost on any airline. Freebird offers straightforward options, which are available at your fingertips round the clock. In addition to the awe-inspiring and immensely helpful idea of this start-up, we are absolutely riveted to their website design. The use of the color red all through the homepage, incites users to action and portrays a sense of urgency, which is further strengthened by the use of the color yellow in Call to actions. The website is divided in intuitive sections, which list all that you would want to know about this service. The “How it Works” video on the homepage also makes it easy to learn the system efficiently. Freebird logo and accompanying tagline, “Power to the traveler”, are also very impactful. The logo icon doubles as a wing flanking the side of “F”. Overall, a great design venture! ZOZI aspires to provide top-notch online booking software for recreational activity businesses and enthuses travelers to get out and experience the best that each place has to offer. For event, activity, and tour businesses, ZOZI Advance is the fastest thriving online customer management, payment, and reservation software, leveraged by a wide array of businesses across more than 90 countries! Zozi helps patrons discover and book millions of travel getaways and activities to people who crave new experiences. Visitors are also regaled by inspiring articles by experts and travel gurus. 5 million people actively pursue Zozi to explore and reserve things to do around the globe, contributing to almost a billion dollars in activities. 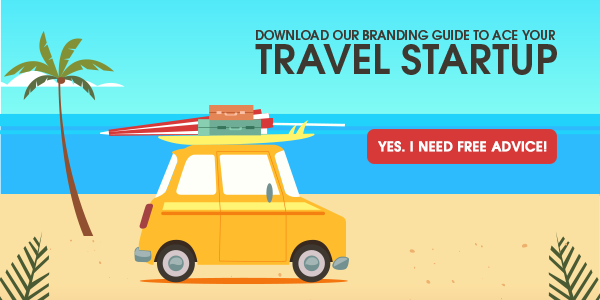 In addition to offering lucrative deals and discounts on activities and places, Zozi stirs the wanderlust of its visitors by its stunning website design. Upon landing on the Zozi homepage, visitors are enchanted by mesmerizing video clips on the website banner, portraying vibrant and enviable shots of people having the time of their lives while out on vacations. Furthermore, the website is replete with over the class photographs, sporting the most popular deals and get-away options. The logo of Zozi is minimal and simple, which not only makes it memorable, but also scalable. Caution: Once you land on Zozi, you won’t be able to get out… It’s highly addictive! Related: 15 Travel Postcard Designs and Designers To Stir Your Travel Nerve! From simple houseboats to splendid hillside villas, Roomorama caters to business professionals and savvy travelers. 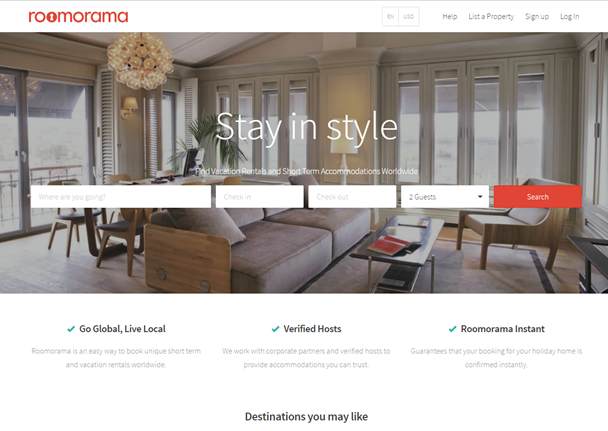 If you want to step inside the boots of a local and experience a diverse assortment of properties from regional websites, property managers, and individuals in 5,000+ destinations worldwide, Roomorama should be your topmost-priority. The Roomorama experience can be yours from Abu Dhabi to Buenos Aires, Paris to New York. Users can rent out a house, apartment, or a room worry-free and 100% profitably with Roomorama’s community-vetted renters. The first thing we noticed about Roomorama is its creative and chic logo design. Notice how the second “O” of Roomorama doubles as a key hole with a clever use of white space. The use of casual font and all-small letters lend this logo a slight warmth and a comforting feel. In addition, the website of Roomorama follows a neat and organized layout and an airy feel which feels good to the eyes. TalkTalkBnb is a collaborative platform that brings people wishing to brush up on their foreign language skills with people wanting to travel the world. All absolutely at no cost! This provides a unique opportunity to travelers to converse with their host in their native language and delve in free accommodations, bed, bath, and supper around the world. On the other hand, it’s also a unique opportunity for the hosts to enjoy practicing languages with native speakers simply by hosting them. TalkTalkBnb is all about bringing travelers and hosts together and allowing travelers to meet new people and share in their experiences. All this could be achieved by the potent power of communication. To reinforce this message, the logo of this start-up features overlapping green and blue circles, with their negative spaces forming two conversing faces. Since the holiday season is upon us, they have slightly tweaked their logo to wear festive Santa hats! In addition, the vibrant colors and illustrations on their website mirror the easy and carefree ambience they wish to foster between the hosts and the travelers. The same punctuation marks used as eyes on the logo, are used consistently to quote the experience of travelers and their hosts. Overall, a splendid and creative design! Do you know of any more travel startups, geared at making travel ever more hassle-free and easier? Do let us know in the comments below!